Your contributions to the Fleming Museum of Art helps us to better serve our audiences in ways large and small, technical and traditional, behind-the-scenes, in the classroom, and in our galleries. 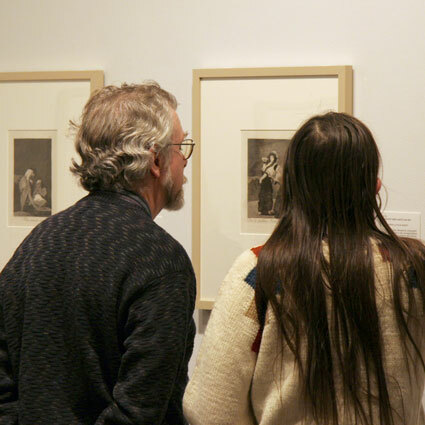 With a collection of 23,000 objects, changing exhibitions, public programs for all ages, and UVM and K-12 classes, there are many ways your generosity helps us to share a love of art. The Fleming Museum’s Membership Program offers participation at various levels in support of the Museum’s core mission: to serve as a gateway for active cultural exchange and critical thinking in our communities and to inspire people of all ages to discover the arts and cultures of the world. When the Fleming opened in 1931, it was hailed as “a practical place of learning — a vibrant, ongoing educational institution for both children and adults.” The Museum continues to play that role today, housing Vermont’s most comprehensive collection of art and anthropological artifacts. The Membership Program serves as a passport to discover this remarkable collection, as well as exciting special exhibitions and a wide range of programs and activities for all ages. Your contribution to the Membership Program is valuable to the Museum and supports all aspects of our operation, from collections care to special exhibitions and related programming. * The North American Reciprocal Museum (NARM) Association membership is a tremendous value. At the Contributing level and above, members will receive complimentary admission to over 1,000 arts, cultural, and historical institutions throughout North America. Learn more at the NARM website. You can now make an online donation to the Fleming Museum online through the University of Vermont Foundation website.